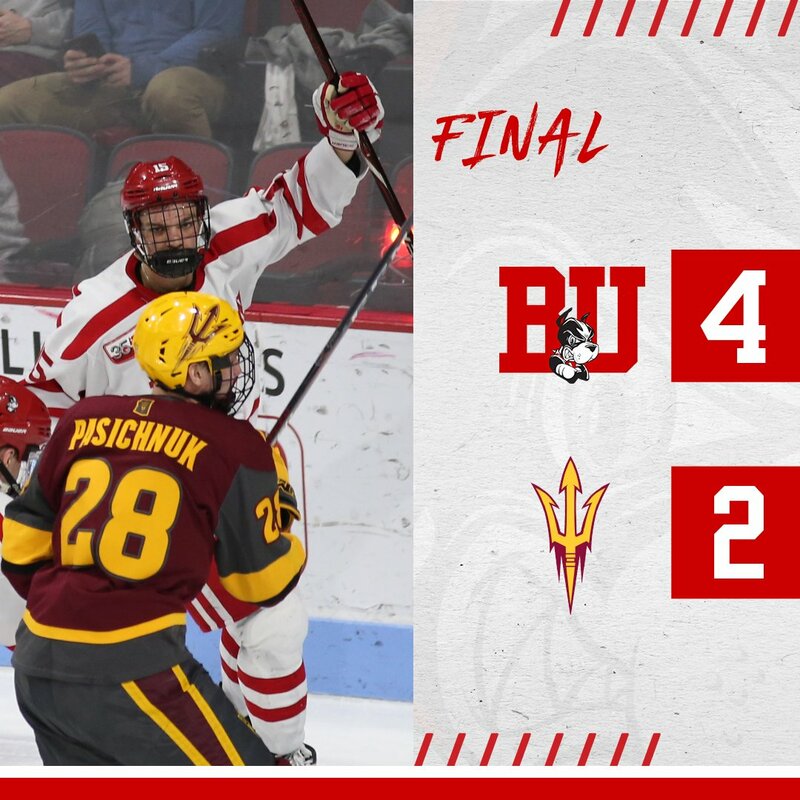 In a game filled with “puck-luck” tallies, BU defeated #17/15 Arizona State, 4-2, behind a pair of Joel Farabee scores and 38 saves by Jake Oettinger. Patrick Curry and Chad Krys also scored, while co-captain Bobo Carpenter’s first of two assists gave him his 100th career point. BU improved to 10-9-3, having won six of its last eight games with one tie. In an all-too-familiar script, BU gave up the first goal just shy of the six-minute mark of the first period. Filips Buncispicked Krys’ pocket in the slot and whirled to find Anthony Croston at the right crease for an easy goal. BU responded at mid-period. Carpenter broke up a Sun Devil pass along the boards, deflecting the puck to Jack DeBoer who slid the puck to Farabee breaking to the net. His backhander beat Joey Daccord to tie the game. As time ran down in the period, Patrick Harper, from the corner boards, passed to a charging Tony Amonte, who redirected the puck to Curry at the goalmouth for his seventh goal of the season. Seven minutes into the second period, Farabee’s centering pass from the left corner hit a Sun Devil defender and skipped past Daccord for a 3-1 lead. The goal, Farabee’s eighth, proved to be the game-winner. Two minutes later, ASU narrowed the margin when Brinson Pasichnuk’s center point slapper deflected off a BU defender and past a screened Oettinger. The deflected scores continued at 12:51 when Krys’s attempted slap pass hit an ASU stick and eluded Daccord for the 4-2 final. Ryan Cloonan and Shane Bowers assisted on the goal. ASU had a 17-6 shot advantage in the scoreless third period, partly thanks to two power plays successfully killed by BU. The Terriers, however, limited the Sun Devils’ quality chances and Oettinger handled the rest. Since his return from playing in the World Junior Championships, Farabee has recorded points (4G,5A) in five of six games and, with 20 points, is second in scoring to Dante Fabbro with 21. The junior co-captain, who assisted on Farabee’s second goal, has a five-game points streak. He also blocked five shots. Carpenter is the 83rd Terrier to reach the century mark in points scored. Logan Cockerill missed the game, serving a one-game suspension following his game disqualification for fighting in the win against Merrimack. #10 Terriers spotted visiting Merrimack an early 1-0 lead, but stormed back to score the next four en route to a 6-3 win at Walter Brown Arena. 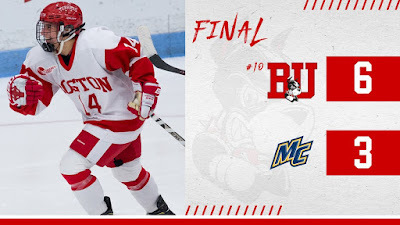 Sophomore Kristina Schuler and freshman MacKenna Parkerboth scored twice as BU stretched its winning streak to six games. Since the end of October, BU has gone 15-3-2. Emma Wuthrich and Sammy Davis also scored for BU. The teams meet again Saturday at 4 p.m. at Lawlor Rink in North Andover.